When you receive your ForceDecks FD4000 or FDLite system, some assembly will be required. Both systems feature the same cables and connections, so this article applies to both. 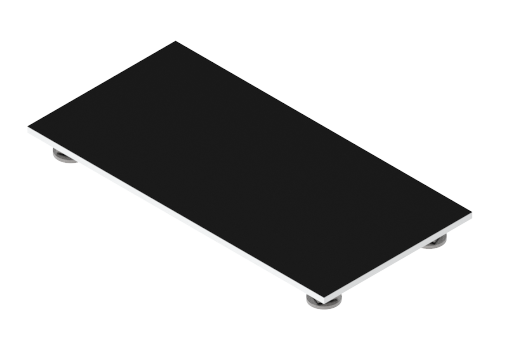 To test the flatness of your surface, step on each corner of the platform to ensure there is no movement or rocking. Spacing Leave a small gap between the left and right plate to minimise cross-interference (which can be caused by the plates touching) and a small gap between the outside edge of the safety frame. Note: If embedding the force plates into the ground or into a weightlifting platform (which is quite common), it is important to leave adequate space for access to the cables. Ensure you have at least a 1m (3ft) radius of clear space around the ForceDecks. Place the Left (Slave) and Right (Master) ForceDecks Plates next to each other. 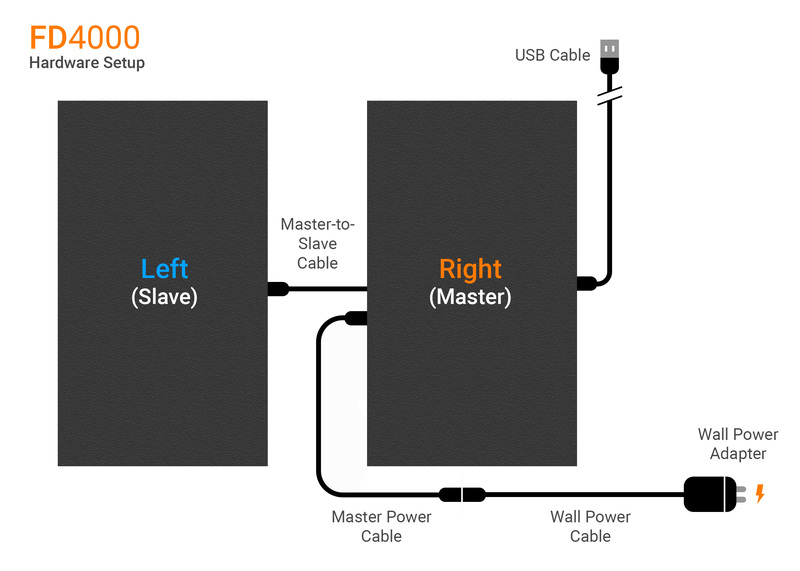 Plug the Master-to-Slave cable into the Left (Slave) ForceDecks Plate and the Right (Master) ForceDecks Plate. Plug the Master Power Cable into the Right (Master) ForceDecks Plate. Plug the Master Power Cable into the Wall Adapter Cable. 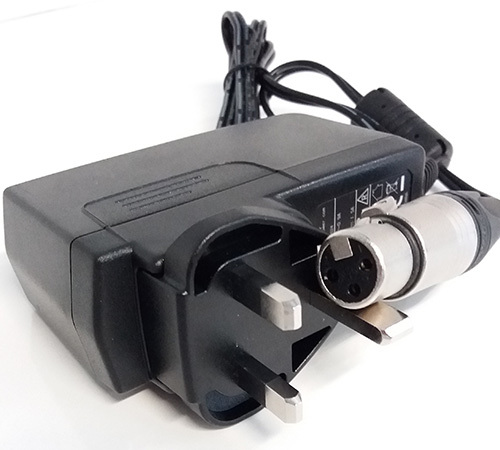 Choose suitable Wall Power Adapter (multiple country adapter types supplied) and click firmly into place. 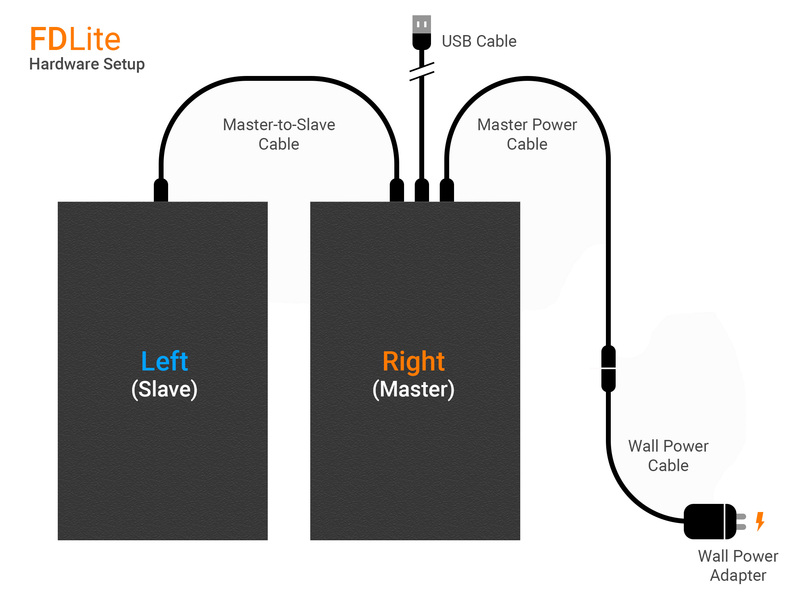 Plug the USB Cable into the Right (Master) ForceDecks Plate, and the other end into your computer.